Two of the strongest teams in the NFL’s American Football Conference faced off in a season-opening game on September 12, 1976. The Oakland Raiders had won their fourth straight AFC West title in ’75 under Head Coach John Madden, although they had once again come up short of reaching the Super Bowl. QB Ken “The Snake” Stabler (pictured at right) guided a talented offense and the defense was a tough veteran unit. One notable change was that, after nine years with the Raiders and 26 as a pro, 48-year-old placekicker and reserve QB George Blanda had finally been forced into retirement by rookie PK Fred Steinfort. The visiting Pittsburgh Steelers were coming off back-to-back NFL titles. Coached by Chuck Noll, they were solid in every way, with QB Terry Bradshaw, the running of FB Franco Harris and HB Rocky Bleier, the talented young wide receiver tandem of Lynn Swann and John Stallworth, and the best overall defense in the NFL featuring such stalwarts as DT “Mean Joe” Greene (coming off an injury in ’75), DE L.C. Greenwood, MLB Jack Lambert, OLB Jack Ham, and CB Mel Blount. There were 51,371 fans in attendance at the Oakland-Alameda County Coliseum for the big opening week matchup. The Raiders drove to the Pittsburgh 30 on the first series of the game, but Fred Steinfort’s 47-yard field goal attempt was blocked. Following a punt by the Steelers, Oakland again drove into Pittsburgh territory. Ken Stabler converted a third-and-five situation at his own 33 with a pass to WR Cliff Branch that gained 16 yards and three plays later, facing third-and-13, “The Snake” again went to Branch, this time for 26 yards to the Pittsburgh 28. But after advancing to the 14, Stabler tried for Branch in the end zone and was intercepted by FS Glen Edwards. The Raiders once more came up empty. The Steelers advanced to the Oakland 35 with Rocky Bleier and Franco Harris running effectively and Terry Bradshaw completing one pass, to Bleier for 21 yards. But on a second down play, Bleier fumbled after making another good run and LB Monte Jackson recovered for the Raiders. Finishing off the opening period, Stabler completed passes to HB Clarence Davis for nine yards and FB Mark van Eeghen for 16 yards to the Pittsburgh 45. Five plays into the second quarter, Stabler connected with TE Dave Casper (pictured at left) for a 30-yard touchdown. Steinfort’s extra point put the home team up by 7-0. After the teams traded punts, the Steelers drove down the field, once again thanks to the solid running of Harris and Bleier. An 18-yard gain by Harris on a draw play put the visitors on the Oakland six, but the Steelers were finally halted at the two yard line. They came away with nothing when Roy Gerela was wide on the short 20-yard field goal try. After the Raiders punted again, the Steelers took over at their 14 and put together a nine-play, 86-yard series. A pass on third-and-eight from Bradshaw to Bleier picked up 24 yards and was followed by an 11-yard completion to Lynn Swann to the Oakland 49. Three plays later, another Bradshaw pass down the middle to Harris picked up 39 yards to the five yard line and Bleier finished off the possession with a two-yard touchdown carry. Gerela tied the score at 7-7 and that was the tally at the half. Neither team was able to mount much offense in the third quarter until midway through the period when, with the ball at the Pittsburgh 37, Bradshaw threw to Harris who ran for 25 yards before FS Jack Tatum grabbed him around the legs. As Harris was being tackled, he lateraled to John Stallworth, and he proceeded to the end zone for a 63-yard touchdown. Stabler threw interceptions to end each of the next two Oakland possessions. The second one gave Pittsburgh the ball at the Raiders’ 39 and on the third play of the fourth quarter Bradshaw connected with WR Theo Bell for an 11-yard touchdown. The Steelers were up by 21-7. The Raiders responded by driving 67 yards in seven plays. 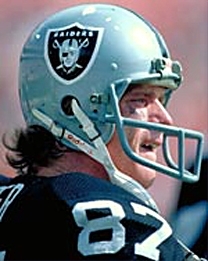 Stabler completed three passes, the last one to WR Fred Biletnikoff making a diving catch for a 21-yard TD. But Pittsburgh came back with a series that included two Bradshaw completions to Stallworth, for 25 and 20 yards, and helped by two penalties on the Raiders, reached the Oakland three from where Harris ran up the middle for a touchdown. Stabler was picked off by Mel Blount on Oakland’s next play from scrimmage and, with less than six minutes left on the clock, the Steelers were ahead by 28-14 and driving. But with a first down at the Oakland 19, Harris fumbled and Monte Johnson recovered for the Raiders at the 25. 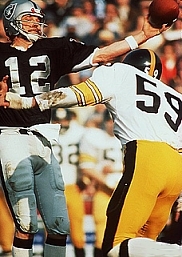 Making the most of the break, Stabler completed three straight passes and, following a facemask penalty on the Steelers and an 11-yard run by RB Pete Banaszak, he completed one more to Casper for a ten-yard TD. The reeling Steelers had a short series followed by a punt that was partially blocked and gave Oakland the ball at the Pittsburgh 29. Stabler tossed three straight incomplete passes before, on a fourth-and-ten play, he hit Branch for 27 yards to the two. “The Snake” rolled out on the next play and ran the last two yards and, with Steinfort’s successful conversion, the game was tied at 28-28. With time running out and the Steelers trying to win the game in regulation, Bradshaw fired a pass intended for rookie WR Ernie Pough that was deflected by DT Dave Rowe and picked off by LB WIllie Hall, who returned it to the Pittsburgh 12. Steinfort kicked a 21-yard field goal to put the Raiders ahead with 21 seconds remaining. Time ran out for the Steelers following two Bradshaw completions to the Oakland 48, and the Raiders came away with a dramatic 31-28 win. Statistically, the game was as even as the final score. Oakland had a slight edge in total yards (440 to 438) and first downs (28 to 24). The Steelers gained more yards on the ground (196 to 116) while the Raiders were more proficient through the air (324 to 242). Each team recorded two sacks apiece. Oakland turned the ball over four times, to three suffered by Pittsburgh. Ken Stabler completed 21 of 38 passes for 342 yards and three touchdowns, but also gave up four interceptions. Dave Casper had 7 catches for 124 yards and two TDs and Cliff Branch and Fred Biletnikoff had four receptions apiece, for 83 and 67 yards, respectively. Pete Banaszak led the Raiders with 41 rushing yards on 10 carries and Mark van Eeghen was right behind as he gained 40 yards on 13 attempts. For the Steelers, Terry Bradshaw was successful on 15 of 27 throws for 253 yards with a TD and an interception. 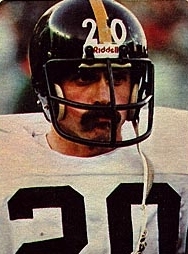 Rocky Bleier (pictured at right) ran for 73 yards and a touchdown on 20 carries and Franco Harris added 68 yards on 18 attempts that also included a score, although he also had the big fumble. John Stallworth caught 6 passes for 94 yards. The Raiders lost only one game all season as they topped the AFC West at 13-1 and advanced to a Super Bowl win over the Vikings. They met Pittsburgh again for the AFC Championship, the Steelers having recovered from a slow 1-4 start to finish first in the AFC Central at 10-4. Pittsburgh had been Oakland’s nemesis in the postseason, having eliminated them in the previous two years on their way to the top, and three times in four meetings commencing with the “Immaculate Reception” win in 1972. But in 1976, it was the Raiders stopping Pittsburgh’s drive to a potential third straight NFL title and grabbing the Lombardi Trophy for themselves. Ken Stabler went on to be a first-team All-NFL and Pro Bowl selection, as well as winning the Bert Bell Trophy as NFL Player of the Year. He led the league in passing (103.4 rating), completion percentage (66.7), yards per attempt (9.4), and touchdown passes (27). Cliff Branch (46 catches, 1111 yards, 12 TDs) and Dave Casper (53 catches, 691 yards, 10 TDs) joined him with the All-NFL and Pro Bowl honors. Fred Steinfort, however, lasted just half the season after converting on only four of eight field goal attempts and 16 of 19 extra points. He would catch on with Atlanta the next year and go on to a seven-season career, with his greatest success coming as a member of the Denver Broncos.